The fig tree – It was one of the most important and recognized trees in Israel. It was a staple food and stories of its value and peril have been woven into Scripture since the Garden of Eden (Gen 3:7). In today’s study we will tackle the morning events on Holy Monday including: a fruitless fig tree and the second cleansing of the temple. 12 Jesus entered into the temple of God, and drove out8 all of those who sold and bought in the temple, and overthrew the money changers’ tables and the seats of those who sold the doves. 18 The chief priests and the scribes heard it, and sought how they might destroy him. For they feared him,13 because all the multitude was astonished at his teaching. 46 saying to them, “It is written, ‘My house is a house of prayer,’ but you have made it a ‘den of robbers’!” 47 He was teaching daily in the temple,14 but the chief priests, the scribes, and the leading men among the people sought to destroy him. 48 They couldn’t find what they might do, for all the people hung on to every word that he said. What is “righteous” anger, and how should it be expressed without causing injury to others or a sinful act on my own accord – in deed or thought? Am I standing in the way of someone else coming to God as did the money changers and vendors? How might I better clear the way for people to get closer to God and worship Him? In what ways is my life not fruitful? What can be pruned or cultivated to make it so? John 1:14 says that God in Christ “tabernacled” among us; and both Paul and Peter call the true church “a living temple” in which individual believers are “living stones” and Christ Himself is the “chief cornerstone.” Seeing how Christ cleansed the temple (twice), in what ways might you need to cleanse your life and put it to proper use for the purposes of God? This is the second occasion in which Jesus used a fig tree to communicate an important message to his disciples and us today. The first occasion is found in §109 in Phase 5c in which the messages is that there is time to fertilize a tree that is not producing fruit. But in this event, which is divided into three sections: 129a (Monday morning), 131 (later that evening – Tuesday for the Jews), and in §139e in the evening of Holy Tuesday, when Jesus’ time on earth has nearly come to an end. Remember that since the reign of King Solomon the House of Judah was symbolized by the fig tree (Jer 24:1-2). In light of such Jesus seems to be be using the fruitless fig tree (and cursing this one) as a symbol that Judah had run out of time. Even after three years of ministry, the majority of the Priests, Pharisees, Sadducees and temple leaders’ hearts were hardened. Not long (thirty-seven years) after their ultimate rejection of the Messiah (the Crucifixion) Titus led the Roman army in AD 70 destroying the second Temple and the rule of Judah. That event (described by Josephus), and the destruction of the 1st temple by the Babylonians in 586 B.C., is memorialized annually in Tisha B’av (9th of Av: July 31-Aug 1, 2017) which is a day of fasting and expectation. It was a fate long since prophesied by John the Baptist §22 Mt 3:10; Lk 3:9. Clarence Larkin in his meaty Pamphlet, God’s Plan and Purposes in the Ages, offers his thoughts on the Jesus’ use of the vine, the olive, and the fig tree. The tree must not have even had the fruit buds. Typically the Taksh (the first unripe figs) appear in April. The fruit buds appear on the branches in February on the newest branches from the previous season, then over the summer the leaves emerge and the first fruit ripens. Some scholars suggest that this verse is to denote the disciples surprise at Jesus’ action, which it certainly did, but it is more likely included in the text to denote that Jesus didn’t mutter the curse under his breath. As you’ll read in §139e he wanted them to understand the importance, reason, and meaning of the cursed fig tree. This is the second time Jesus cleansed the temple. The first (three years before) was recorded in §31 John 2:13-22. That is those who were selling lambs for the Passover. Pastor Chuck Smith explains that outside of the temple area you could buy a lamb for just fifteen cents, but the priest would examine it carefully looking for a blemish, though those that were bought for five dollars in the temple precincts passed without any inspection. The sheep and oxen were probably for the “Chagiga” the “remembrance meal” (which Jesus and the disciples celebrated in the upper room) that begins Passover to its spiritual fulfillment. Money changers were ‘needed’ because the priest would not accept unclean Roman coins in the temple treasury (see: The Coinage of the Herodian Dynasty (37 B.C.E.–C. 95 C.E.) in the Encyclopedia Judaica). There is nothing in the Torah that required this, it was an act of greed, a business opportunity the religious leaders invented – and Jesus would have none of it. Jesus is quoting Isaiah 56:7 and Jeremiah 7:11. Not only was Jesus qualified to be the Ruling Zadok (Melchizedek) he also threatened the financial power of Ciaphas and the many loved and followed him. Like John the Baptist, he would not tolerate the corrupted priestly activity in The Temple at that time. Jesus was the one man with Davidian and Zadokite bloodlines back to Aaron (See §3) for which John too was executed (§71b). Jesus had the royal bloodline as a Priest-King of Israel, the miracles he performed were evidence that he had the messianic mantle and his very presence was a direct threat to The House of Annanias and his son-in-law, Caiphas, the high priest. 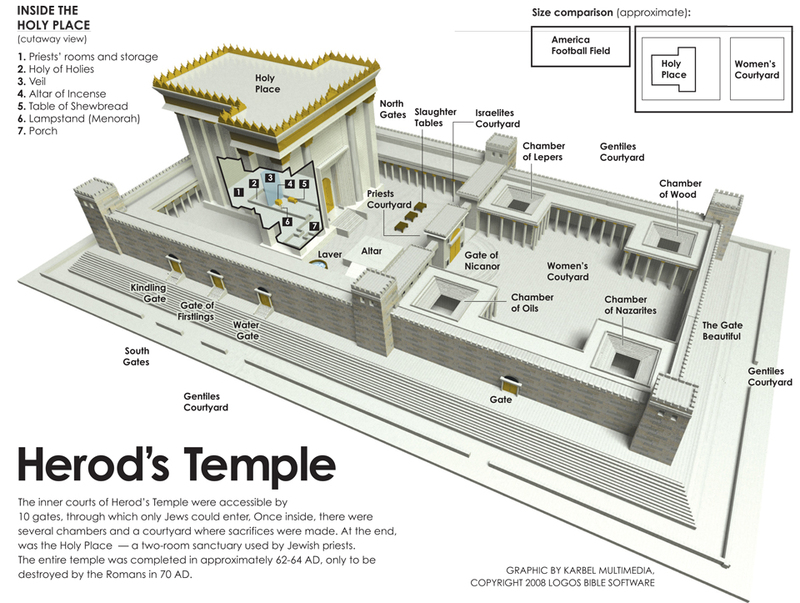 Jesus was teaching there in the second temple. For more on the Temple Mount and the tribulation the Bible Scholar and Physicist Lambert Dolphin offers sound teaching as to the events and Scriptures concerning the first, second, third (and fourth) temples.